This little project is ridiculously simple… but what a novel idea! Great for the frequent traveler, it takes up no space in the suitcase, but will come in so handy in a hotel room, on the bed stand or bathroom counter. 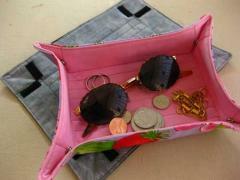 Keep all your small items together – keys, jewelry, eye glasses, etc. Along with our Bag Handle Wrap, this is my favorite travel item and has saved me more than once from losing an earring or other small item on a hotel room bed (have you noticed they ALL seem to have the same floral print bedspread? ).